Be the first to share your favorite memory, photo or story of Toby. This memorial page is dedicated for family, friends and future generations to celebrate the life of their loved one. 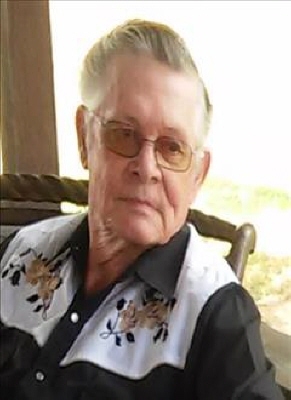 Toby Leon Barnhart "Leon" went home to be with his Lord and Savior Jesus Christ peacefully Friday, April 5th, 2019 with his wife by his side. Leon was born August 11th, 1941 in Kingfisher, OK to Tob and Cleta Barnhart. Leon loved to kid and joke with children and teenagers and they loved to try and out wit and argue with him. He had a wonderful sense of humor. Leon worked for Clay Pipe of Seminole, Commercial Brick in Wewoka, he also worked as a mechanic and in the oilfield. He loved to work in the garden and mowing his five acres of lawn. He loved to witness about his lord and savior Jesus Christ. Leon was married to Nora Floyd and to this union two children were born. Leon later married Claudia Jean Brady Barnhart and to this union one child was born. Leon is survived by his son; Richard Leon "Rick" Barnhart, daughters; Susie and husband Glen Elliot, and Emmy Lou Barnhart of the home: grandchildren and great grandchildren, brother; Kenneth Barnhart and wife Mary, sisters; Linda Lovett, Treva Anderson and Robin Northern and three brother in laws; Edward and wife Brenda Brady, Bill and wife Mary Brady and Tim and wife Rosemary Brady. He is preceded in death by his parents, first wife and his mother and father in law Warnie and Maye Brady. Special thank you to all the nurses at Life Spring and Heartland Hospice. Goodbye my love, my darling1400KZ. Leon will be greatly missed by his family, church family and the Moores grocery store family. Pallbearers are Donnie Shaffer, Scott Johnson, Tony Johnson, Glen Elliot Sr., Glen Elliot Jr. and Wesley Elliot. Honorary Pallbearers are Bill Brady, Edward Brady, Tim Brady, Raymond Sharpe, William Chesser and Kevin Merriman Sr.
Funeral service will be 10:00 am Wednesday April 10, 2019 at Stout-Phillips Funeral Home Chapel in Wewoka with his Pastor and friend whom he loved as a brother; Pastor Bill Chesser officiating. To send flowers or a remembrance gift to the family of Toby Leon Barnhart, please visit our Tribute Store. "Email Address" would like to share the life celebration of Toby Leon Barnhart. Click on the "link" to go to share a favorite memory or leave a condolence message for the family.